The Sawdust City Brewing Co.: Beer in the Summer? Haven't Tried That Before. Beer in the Summer? Haven't Tried That Before. Howdy Y'all, so it's been a while since we last spoke, but it's summer and it seems people like to drink beer in the summer. Go figure. And although this is Sawdust City's first official summer brewing beer we've been extremely busy, slingin' pints and getting our name out to all you good beer drinkin' folks. And shucks, it seems to be goin' all right! But with so many great events going on across this great province of ours, it's all we can do to keep up. But we're determined gadnammit! So we've pulled up our socks, put our heads down and hopefully you've had a chance to hear, see or drink some of what we've been brewin' up here in Sawdust City. But if you haven't, cause you've been our enjoying all this wonderful sun we've been having, don't fret, we've got yer back. We've throwin' together a little recap of the summer so far for ya here on the blog, so buckle up and take a read! After the chaos that was OCB Beer Week back in June, Sawdust City kept the momentum going right into July with a radio spot on the Fearless Fred Show on Edge 102. For those of you that didn't get a chance to hear it, here is the full interview. This was the first time I was actually on air, but this interview marks the third time Sawdust City has been covered by Fearless Fred and Chris Schryer. So big thanks to them and all the support that they've given us. That same week, the National Post did a write up on Session 99 Craft Beer Fest and some of the summer beers available during the show and throughout the summer. And yes, Sawdust City made the cut! It not only talks about us, but also some other great Ontario craft breweries like our good friends at Spearhead and our neighbours in the North, Lake of Bays. Again, if you haven't had a chance to read the article yet, here's the link...have a read. We took a bit of a hiatus in early July as we'd run ourselves pretty ragged, but in that down time we were able to get the next batch of Kolsch brewed and learn how to use our brand spanking new 4-head HDP bottle filler. 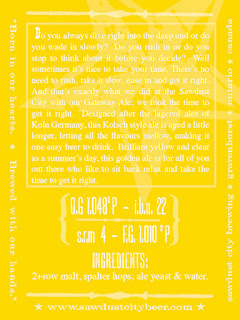 The Kolsch is tasting great and should be in bars by early next week, but the filler still has a few kinks to work out. Let's just say there is a bit of a learning curve. But that's okay, we'll get it working smoothly and hopefully more growlers and bombers will find there way into bars across Ontario very shortly. That little break also gave us time to head back up to Niagara and check the progress of Princess and Girlpants as they quietly age in the two oak blueberry wine barrels. I took a sample and they were both tasting great. The oak character hits you right away both on the aroma and on the palate. The hops have mellowed and it's become a different beer altogether. We are going to age it for a few more weeks and then we will be kegging it off and then packaging the entire batch into bombers. Look for this new beer, Princess and Girlpants Meet the O.D.B. in mid-August at a great beer pub near you. But hiatus' have to end and it was back to slingin' pints. 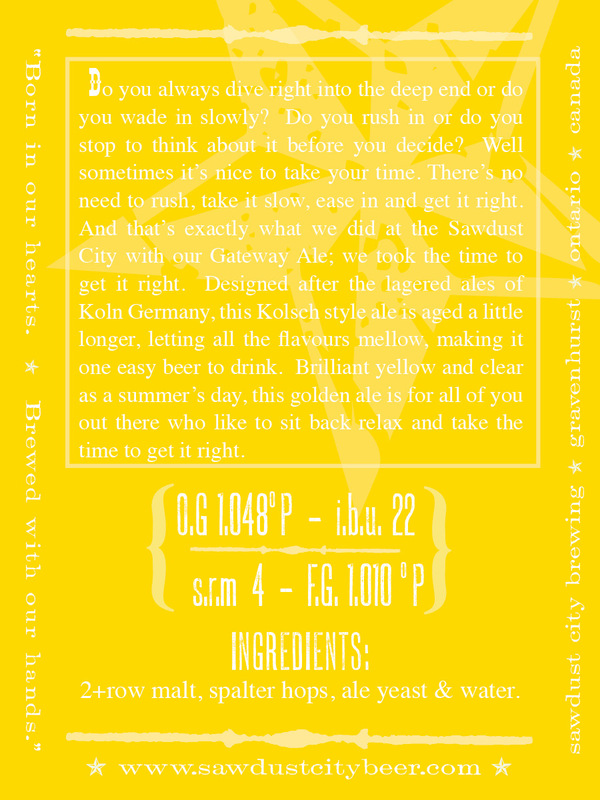 Last week we had the honour of pouring some Golden Beach Pale Wheat and How Do You Say Monkey in Latin? back home in Gravenhurst. To celebrate the opening of the new Norman Bethune Museum, the Chinese "twin" city of Gravenhurst, Boading City of the Hebei Province sent some dignitaries to Muskoka to witness the ceremonies. It was great to be part of the event and have the chance to not only meet some new local faces but to also meet some new Chinese friends. A few short days later it was back to our second home, Toronto, for a Toronto Festival of Beer satellite event at WVRST beer and sausage hall. Along with Great Lakes, King Brewery, Flying Monkey's and our good pals at Black Oak, we poured some beer to pair along side the sausages prepared by WVRST. Again, it was a fun event and it's always nice to get out and talk to people one on one about the beer we are brewing and what's happening with Sawdust City. This will be our second kick at the can, so we've made a few adjustments to improve upon last years wonderfully delicious brew. This time around we're brewing it a little earlier and giving it a few more weeks to age and hopefully clarify a little more. But other than that, it's basically the same recipe, a melange of grain, berries, teas and spices from all across our great nation. So if you enjoyed it last year, come out to the CNE again and try this years version. I'm sure you'll be even happier! To bring a close to July, Sawdust City will be doing a "Mash-up" with our friends at Spearhead for the Toronto Festival of Beer. We're taking one of Spearheads newest brews and one of our brews and making a summer time concoction like no other. It's top secret, so I can't divulge which brews each one of us will be bringing, you'll have to come by the Mash-up tent to find out for yourself! August starts with a bang. First up, we got the parking lot party at the Griffin Gastropub in Bracebridge on Friday, August 3rd. Along side our good friends at Beau's All Natural Brewing, Sawdust City will be pouring a number of different beers to the thirsty Midnight Madness patrons. Like every year, this will be a very well attended event with lots of great music, amazing food and tasty beer, so come early and stay late! 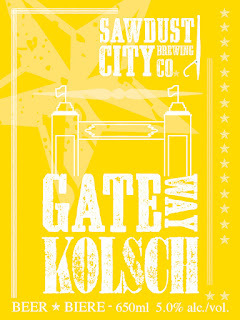 Two days later Sawdust City will be pouring at the 30th Annual Khashe Lake Craft Show. This will mark the first time in the thirty year history of the event that they will be pouring beer. 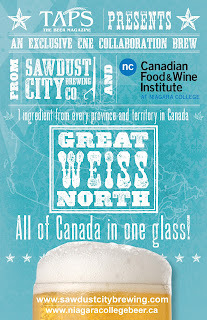 Sawdust City is extremely proud to be the first brewery to do so. 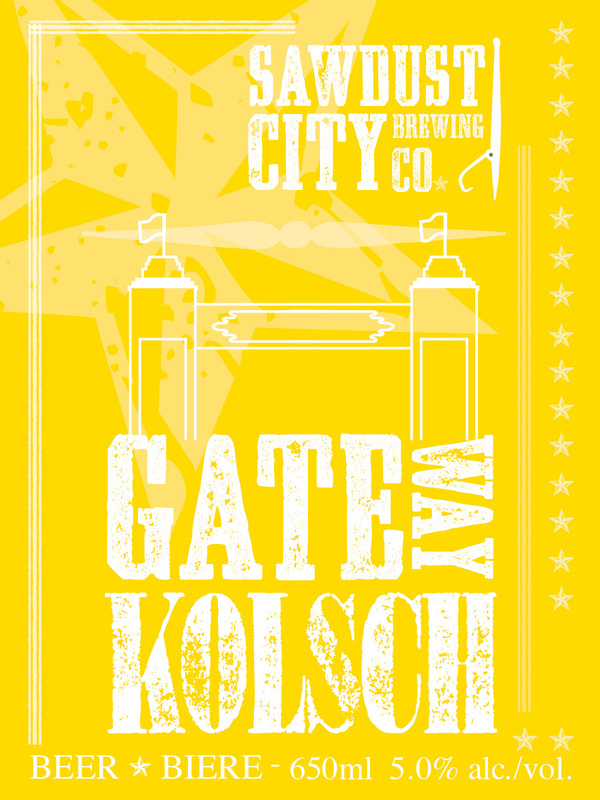 We'll have Gateway Kolsch and Ol'Woody Alt pouring so if you haven't had a chance to try either, this would be a great time. Held at the Rockhaven Inn on North Kahshe Lake Road, there will be many local artisans, bakers and craftsmen displaying there wares, so come for some craft and try some craft beer! The very next day we are off to Savour Simcoe. In it's 5th year, Savour Simcoe celebrates local heritage, agriculture and regional cuisine and Sawdust City will be there sampling some our beers. So if by late August you still haven't had a chance to try our stuff, come out to this wonderful event and try it along side some great food and drink from other amazing local artisans. Well sheesh, that got a little long winded there! But I think I got pretty much everything covered. So like I said, it's a busy summer and we really do hope to see y'all out at some of these events.